Paul Jarvis is expected to be out for another 5-6 weeks with a broken foot. Doncaster Knights’ squad reported back for training today knowing that they could be just one win from securing their place in the Championship play-offs. As a result of their win at Cornish Pirates on Sunday, and other results going their way over the weekend, defeat for Nottingham on Friday night would mean victory at London Scottish for Knights on Saturday would put them out of range for the fifth-placed club with four games to spare. 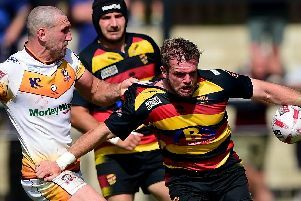 “It’s certainly a massive incentive for us,” said director of rugby Clive Griffiths, who gave his players the day off yesterday following their seven-hour plus journey back from Cornwall. “It’s a long way back but it’s always better when you’ve won. Our performance was a bit patchy at the start and they took an early lead so we had to re-group pretty quickly and we did that and we came in 8-5 up. “But it had still been a pretty nervy first half. We lost possession three or four times in good attacking positions. “Our first try after half time was outstanding to be honest and we were pretty dominant for the next 20 minutes or so. It would have been nice to have picked up a bonus point but it’s never an easy place to score four tries or more. Centre Mat Clark (calf) could return but full-back Paul Jarvis (broken foot) faces another five or six weeks on the sidelines.